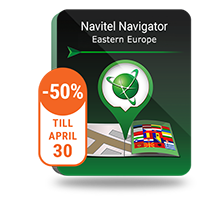 Russia, Belarus and Kazakhstan Q2 2017 maps are now available to the users of Navitel Navigator. Q2 2017 updated map contains 161 205 towns and settlements, including 17 510 settlements with address search support and street network. Database of Points of Interest is enriched — updated map includes 1 301 299 POI. The road graph is 3 893 245 km. 9 544 234 unique addresses are available for search. The map of Russia details 228 towns and settlements in the republics of Bashkortostan, Ingushetia, Karachaevo-Cherkessia, Karelia, Mordovia, Khakassia, Chechnya, Chuvashia; Arkhangelsk, Kemerovo, Kurgan, Leningrad, Omsk, Orenburg, Samara, Sverdlovsk and Tyumen regions as well as the Khabarovsk Territory. Updated maps of the towns of the Moscow region: Drezna, Lukhovitsy, Noginsk, Pavlovsky Posad, Chernogolovka, Elektrogorsk. 16 charging stations for electric vehicles have been added to the map of Moscow. In the POI database, the coordinates of the branches and ATMs of the following network banks have been updated: Alfa-Bank, VTB-24, Credit Europe Bank, Mosoblbank, Raiffeisenbank. New POIs have been added: VTB Bank of Moscow, diplomatic missions in Moscow, MFC Moi Dokumenty. The map of Belarus contains 23 702 towns and settlements. 1533 of them are settlements with address search support and street network. 654 542 unique addresses are available for search. 66 422 POI have been added to the map. The road graph is 284 321 km. The entire base of the speed cameras has been completely updated throughout the country. The map of Kazakhstan contains 9 776 towns and settlements. 224 of them are settlements with address search support and street network. 319 917 unique addresses are available for search. The map included 21 947 POI. The road graph is 1 259 026 km. The address base in Almaty and Astana has been updated. Changed the names of streets in the towns of Kaskelen and Uzynagash. Each map includes residential and industrial infrastructure with address search and detailed road network with traffic direction, interchanges, roundabouts, and other relevant information. Important! Please note that the maps of the Q1 2017 release work with Navitel Navigator 9.7.2493 only.